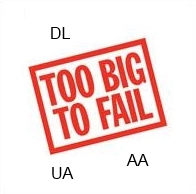 Are the big 3 airlines now “too big to fail”? What if? But some, like consumer advocate Chris Elliott are asking if it is time for UN-merging some airlines rather than continue the consolidations. The financial crises that started in 2007 resulted in some amazing financial events unprecedented in scope and reach. There was a real possibility for the financial meltdown spreading and major banks going under was not an option – the repercussions on the economy were unacceptable. Fast forward to today with the airlines. We now have 3. Sure there is Southwest and Alaska and Jet Blue but for size and reach there are really only 3. What would happen if 5 years from now one of them, for whatever unforeseen occurrences, is in risk of going under and ceasing operations. What about all those employees. Also, what if that left only 2 major airlines in America. Would that be acceptable? To have only two choices in air travel? Would there be real competition with only 2? Would the government be forced to step in and “save” the ailing airline or even all 3 if things looked bad enough? From a totally selfish standpoint I look forward to having my US Air and AA frequent flyer accounts merged and booking a bunch of 1st class trips with my bloated AA accounts. After that, it will be most interesting to see what the AA looks like a year or two from now. Also I do miss some of the good things about the old NorthWest Airlines (like a working award page & a reliable partnership with KLM to name a few). I’ve previously mentioned this exact kind of concern about the government allowing for airline market mergers that heighten greatly the “too big to (allow to) fail” risk situation. That said, those countries that had duopolies of sorts — Australia and Canada — seemed to have allowed for one half of the duopoly to fail and did so with rather limited repercussions for taxpayers in the main. No one is too big to fail. They can partially fail. My wife is convinced…and then there will be one. We must add Southwest to this group. They fly more people domestically than any of the big 3. Plus now they they will be going international that could lead to making them much bigger. Plus they have a reservation system that can assign seats since it is required for international flights. I think a bigger problem for competition than the number of airlines are other restrictions, like availability of landing slots and gates etc. There are really two markets: international air travel with plenty of foreign airlines competing with the big 3 US airlines. As more and more non-stop international flights are offered, the advantages of the big, domestic hubs are reduced. And domestic air travel with Southwest, Virgin, JetBlue and others providing competition. But the big 3 have “inherited” so many slots, gates, etc that it is harder for the other carriers to compete. That should be addressed, much more so than in the settlement of AA/US with the DOJ. No company should be too big to fail. Either compete and succeed or get out of the way. THAT benefits consumers, not taxpayer funded bailouts.